Strange but true: heart disease and cancer rates are falling! The reason these diseases are becoming less common is most likely multifactorial: better lifestyle choices, better diagnostic abilities, and better treatments probably all play a role. However, it’s important to note that one of those factors is patient-powered – better lifestyle choices. The most profound impact we can have on our own heart disease or cancer risk is what we choose to put in our shopping carts and on our table, and our choice to stay active and get enough sleep. 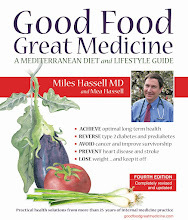 For a wealth of practical strategies to help incorporate those choices into your own life and transform your health with lifestyle medicine, see Good Food, Great Medicine.